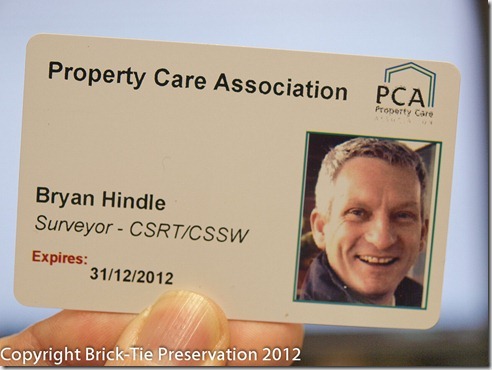 You are here: Home / Damp / Property Care Association launch official CPD scheme – hurray! The PCA have launched a CPD scheme for members to subscribe to. I have my card and am already totting up the points for the year. 25 points are needed annually to remain ‘current’ and I have 12 thus far. These are from the 6 hour mould seminar with Caoimhin Connell for the PCA and my full day spent with Graham Coleman last month, receiving one-to-one tuition on damp diagnosis. Why bother? Well, I believe that in life, we never stop learning and there’s always something new to discover. Clients rely on surveyors for up to date information including the latest regulations and methods. Many PCA members already take their on-going training and development seriously, but up to now they’ve had no way of demonstrating that or enjoying a structured program of self improvement. It’s reassuring for customers too because let’s face it, some of us are not getting any younger and on the one hand clients like to think they have an experienced surveyor working for them, whilst on the other they don’t want somebody who qualified 30 odd years ago and has not kept up to date. Clients now have the best of both worlds – experience and proven currency – brilliant. I have two CPD presentations in the pipeline (one for structural repairs and one for damp and condensation – both for groups of RICS surveyors) and a session talking to Leeds building Surveying students about damp, plus I am mentoring a student for a days Damp & Timber surveying next week. My NVQ level 5 in occupational health & Safety starts at the end of the month and I hope that counts towards the scheme too. I think that the Property Care Association is once more demonstrating that as a trade association they are serious about maintaining standards and they should be applauded. Mind you – those members that don’t subscribe to this ‘optional’ CPD scheme, may find themselves having to explain why not in the near future, as those who do subscribe start promoting the fact…. like I have here. Dean has been joined ! He too attended the mould seminar and next week is booked onto the CSSW course – we have also booked our junior technician onto the PCA technician course (although that doesn’t count!) and will be attending regional meetings – Absolutely, this should be applauded and I will be looking for other methods to gain points – However, I don’t believe Deans recent FA football coaching qualification counts ? Shame !! Take Care Bryan – maybe one day you can mentor me ! I sure need help ! Thanks for looking in. Well done to Dean for enrolling and I’m sure that the scheme will benefit all members. I started my NVQ 5 assesment today and it was very interesting – mind you I’m also studying Stoic philosophy at the moment so maybe that will help me see the better side of life – won’t count to the CPD though…oh well. I hope all is well at planet timber and damp and do call if I can help at all.